Zapier is a tool which is more effective, helps to connect with various application and automates the flow of information between them by saving the time. 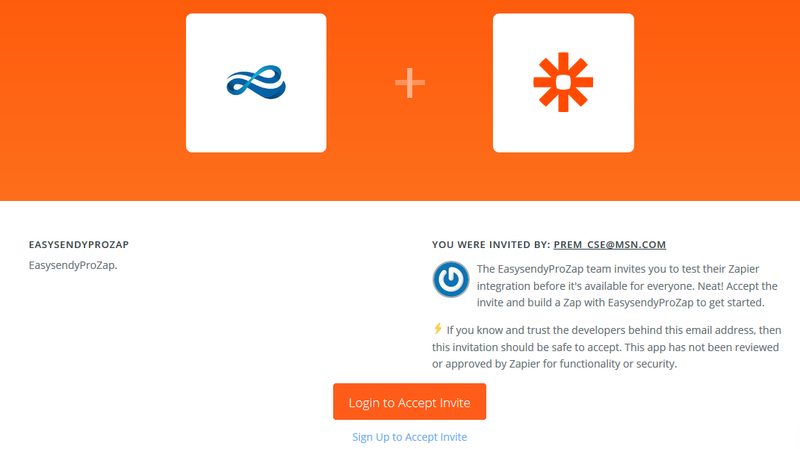 Integration of EasySendy Drip (or EasySendy Pro) with Zapier’s simple interface makes the use of services and application easier. You can easily add email subscriber’s first name and email address into EasySendy Drip (or EasySendy Pro) from the Zapier connected applications. 3. Now after Login to Zapier, click on “Make Zap” and after that, select the Triggered app for integration(Google Contacts, Spreedsheets, Salesforce etc.) as per your convenience. Configure the triggers according to your requirement of the application. 4. Next, you need to connect Actions with various trigger apps with EasySendy Drip (or EasySendy Pro) (EasysendyProZap). 5. On next screen add your EasySendy Drip (or EasySendy Pro) account API key. You can follow this guide to get the API key. After entering EasySendy Drip (or EasySendy Pro) API key, select the email field from your triggered application account. 6. Then, select the “List UID” from the dropdown menu, this is your EasySendy Drip (or EasySendy Pro) email list. Then, continue to next screen. 7. On this screen, you can test your Zapier zap. It’s goo to complete this step. Finally, save the zap and switch it on to enable this zap sending the email and first name to EasySendy Drip (or EasySendy Pro) email list.